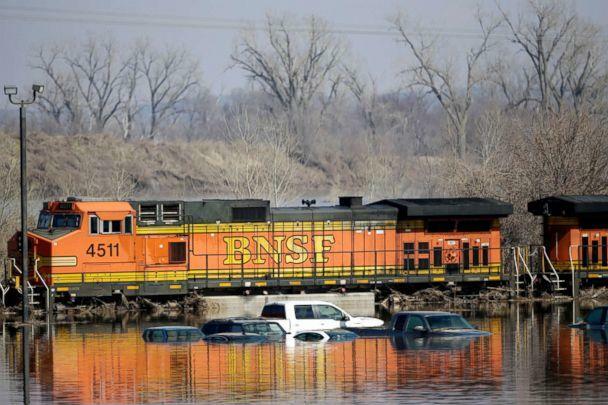 The Daily Mail published this photo taken yesterday of a BNSF train stopped in floodwaters at Plattsmouth, Nebraska. The photo is by AP photographer Nati Harnik. My heart goes out to all those affected by the present flood event. Quite a sight. Not sure why they ventured in that far. 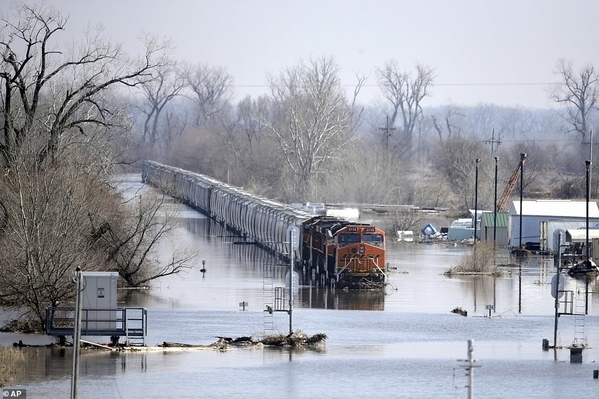 Saw some pictures and commentary a number of years ago about when the railroads still had some steam engines, they could send those in to deal with these flooded track situations - they could go right through it. Obviously the diesel-electrics with the electric motors on the axles don't play well in water. Plattsmouth = the joining of the Platte River with the Missouri River, so a double-whammy. Lotta' damage, uncounted livestock drowned. I wonder if planting will be delayed? These kinds of torrential rain events are indeed not your Father's Buick. That would be the DC traction motors, with their large diameter commutators and carbon brushes. NOT the modern era AC, 3 phase, induction traction motors. Saw a pic at work yesterday or the day before, taken from the other side of of the tracks - the W whistle post (blocked from view by the train in the pic in this thread) is partly submerged; could now also be a water warning. NKP Muncie: Thanks for identifying the photographer. Now l am trying to remember if steam cars (automobiles), or gasoline were preferred when things got afloat in the moat....think steam if burner high enough....electrics? Detroits.. Studebakers....etc. Foggetaboutit? One more picture. Experts say the record midwest floods are being caused by unusually large snowfalls followed by unusual warming happening unusually quickly. It appears the lead engine is a C44-9W with DC traction motors. Yeah. That's the point, and the word for what's going on. "Strange" might serve as well. And it's "concerning." There was no "venturing" going on here. I am sure when they stopped at this signal the water was not as high as shown in the photo. They were only going where the dispatcher thought it was safe. Once they got the red signal, what could they do, back up and turn around? Plattsmouth NE is a major East-West crossing for BNSF over the Missouri River with a double mainline. Would water damage or ruin the oil/grease to lube the truck? The roller bearings in the truck, on AC traction units are all sealed, so no damage. On DC traction units, LOTS of problems from water. Very little if any damage. On EMD, the radar system? No, as the radar transceiver is mounted pretty high up on the rear of the front couple pocket/draft gear portion of the underframe. There were a number of factors leading to this. We have had a cold February with more snow than usual. There was still a good snow pack on the ground and the ground was still frozen when temperatures rose and we got heavy rain that also served to melt the snow. So the rain and snow melts could not soak in, the ice on the rivers broke and jammed against bridges. Additionally, releases from reservoirs in the Dakotas had been increased to make room up for expected snow melts. All this hit at the same time, with little warning. I know that BNSF had several westbounds on the Iowa side that they sent back east to detour. We've had this before. What's different this time was the rain. The snow depth was high but not that unusual. "A monster." Sounds like more than just rain as the factor. Quite an unusual combination. Now, the Omaha World-Herald reports flooding of at least a third of Offutt Air Force Base, including part of the runway and at least 30 buildings. The floods forced aircraft to evacuate, but the headquarters of US Strategic Command, which oversees the US nuclear arsenal, remained unflooded, according to the World Herald. This kind of extreme flooding threatens military readiness and, in this case, our nuclear capabilities, according to Francesco Famia, CEO of The Center for Climate and Security. All man made causes. Building dams. Building in low plains. Can't out build the planet. I wouldn't harp too loudly, building in in earthquake prone CA also counts as "Can't out build the planet". I suspect the water level rose after the train reached a certain point and had stopped. Would not have been a smart move for the engineer to simply plow into the flood. Fairly typical contemporary "news" reporting. One of the truly damaging developments of the way the news is reported is ratings-driven weather reports. Sensationalization is sort of expected in political reporting, but its distortions are ruining the utility of weather reports. Words like bomb and monster have no place in weather. Such things follow the trend of naming winter storms and issuing breathless warnings about an anticipated 4" of snow and 0 degree temperatures: "Get to the store and buy your milk, eggs, and bread: we are issuing a French Toast Day Warning!" This flooding is tragic, but it is hardly unprecedented. What we have here is more journalistic irresponsibility. Give us the facts; keep the hype. I agree, that words used to describe this series of events were designed to be a bit dramatic. However this flooding was definitely unprecedented. My house is located on a high point near a flood control levy, and we were evacuated. Luckily for us the levy held and returned home to dry basement and life went on. The whole state has been affected with this weather. You were either buried in snow, or looking for higher ground to escape flood waters. all the while pretty much every road was closed. As of this writing, almost every road that crosses the Platte river east of Highway 81 is closed & damaged due to flooding with little hope of reopening soon. Gavins point dam on the Missouri River, rests on the Nebraska & South Dakota border. This is last dam on the Missouri River and plays an extremely important role in flood control from Yankton, SD all the way to St. Louis, MO. In 1997 we experience the "great flood" on the Missouri, dam releases from Gavins topped 70,000 CFS. In 2011, we head another that dwarfed 1997, releases at Gavins topped out at 160,200 CFS. These two floods were due to excessive snow pack and run off from Montana, and aerial flooding statewide in Nebraska wasn't a concern like it is now. This time around the flood stage on the Missouri river in Omaha beat records set from both floods from 1997 and 2011, but Gavins point dam only topped it's release at 90,000 CFS and that was only for 12 hours. In 2011, we sat at 160,000 CFS for weeks! All of the tributary streams, creeks, and rivers in Nebraska running into Missouri near Omaha are to blame this time. So yes, the situation in Nebraska is extremely series. Hardly anyone would know this due national media coverage which up to now has been zero.